Tried to capture this new (oh so amazing!) holographic bag as good as possible, but damn that's difficult. It's even 100000x better when you'll see it in real life. You can get your own here! (click). Your pants are honestly so pretty, I'm obsessed with velvet and I love how you paired it with that holographic bag! Leuke look! Je tas is echt een eyecather! Ooh, wat een leuke outfit! Vooral je trui vind ik heel leuk. Je hebt de tas mooi gecombineerd :D .
Ik vind het leuk om te zien hoe je stijl evolueert! 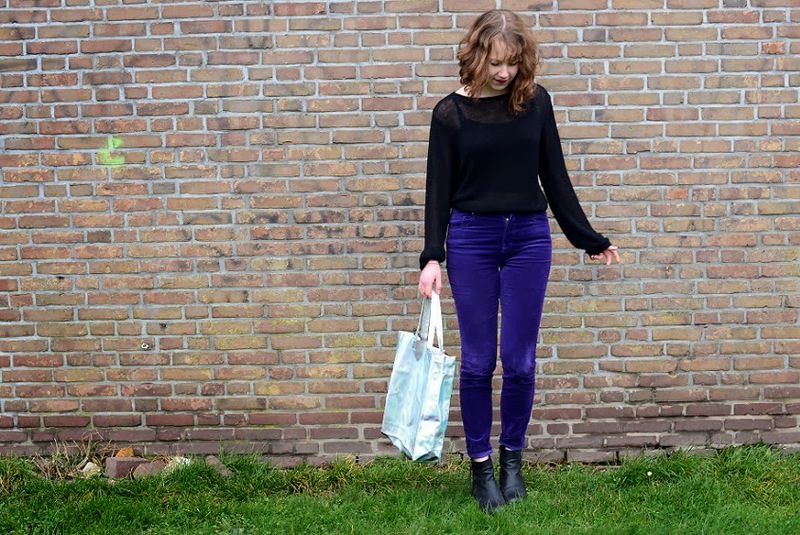 :) Leuke outfit! You look awesome, I love your pants. Looking gorgeous, love your pants! Pretty velvet trousers, the color is Fantastic! Love the easy vibe of this outfit. Amazing trousers, I've been looking for the perfect velvet trousers everywhere and yours fit the bill. Awesome holographic bag too. oh gosh this pants are so great! Love the pants!! They are so original!